So much yarn, so little time. : Let's meet....TWINKLYSPANGLE! Time for me to join the merry throng of blog interviewers - and where better to start than with the ever-colourful Katie? I'm a trekkie - I've never even seen Star Wars but can name all of the captains! Me too! Wanna see my original series sweatshirt? Unbelievable - we were separated at birth. Even my hair is "cyber purple"
Right now, a weekend in the country sounds amazing. I'll go and clear out the spare room then - see you this afternoon? I like all telly, especially those documentaries called "I was born with eight heads"
Oh yes - the ones where her father is married to a girl young enough to be her daughter...no, wait, that's my family. Now we’ve got you warmed up…here's the difficult ones! I’ve known you for ages (seems like a lifetime!) as TwinklySpangle, but you’ve recently decided to move shops on Etsy. Why is that? Did the carpets need cleaning? When I signed up to Etsy I didn't really know what I was doing. I used to craft memory boxes for people as gifts when they had babies, keepsake boxes, so I thought keepsakekatie would be a good name. 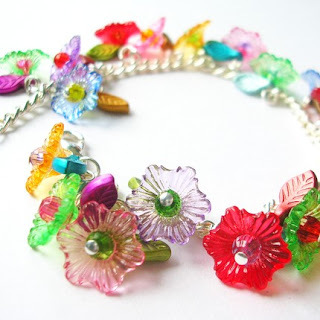 But, when I rediscovered jewellery making I realised that my usual email address/neopets name (don't ask! )/everything I'd ever signed up to online suited it better, I wanted to change, but I was too scared to bite the bullet. I've done it now! KeepsakeKatie is still selling. I need to work on the switchover more, I think. I kind of figured since I was twinklyspangle on flickr and twitter, people would be able to find me more easily if I am TwinklySpangle on Etsy. 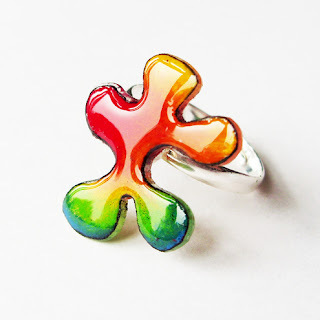 Where else, apart from Etsy, can we find your spangly goodness? My Dad, who is a computer whiz, has been desparate for something to sell online for ages and he has taken me under his wing. He has bought and paid for www.twinklyspangle.com which we plan to use as my main selling venue. I also sell on Folksy www.twinklyspangle.folksy.com and have recently been accepted to Lollishops. I haven't started my shop there yet though. Do you stock all your jewellery in each of your shops, or do you have different ranges for different sites? Why? I keep my prototypes and one-of-a-kind items for Etsy right now, and my standard range that I can make in batches. I will be moving the unique things over the other site at some point, but I don't want to sell the same item twice in the same day. Me too! I've only had to panic-knit the once, thankfully! My intention is to make each shop to look different, to make it worth people visiting them all! 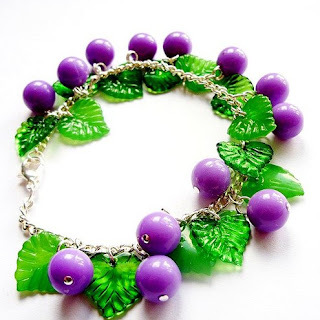 I bought your Meadow bracelet last year, it’s gorgeously girly and I love it. Your new range is very different (though no less gorgeous). What inspired your change of style? 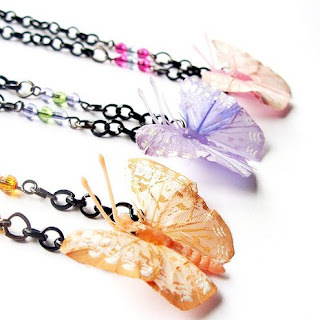 Will you still be making beaded pretties as well? It's weird - because originally I was obsessed with charm bracelets. 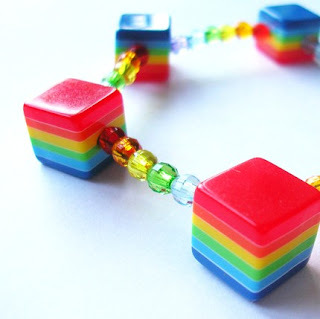 The thing is, that some people, especially who live in cold climates, don't wear bracelets, so I knew I had to expand my range if I wanted to make something of it. Let's be honest. It's hard to make a living selling earrings, so I really needed to find something unique. I unearthed a pack of shrink plastic in my local craft shop, and thought I would give it a go, and now I seem to spend most of my time colouring it in. It works for me because I have recently gone back to work full time. I can sneakily colour in while I'm meant to be working. Oh wow - what little girl wouldn't want to spend her days colouring in when she grows up? 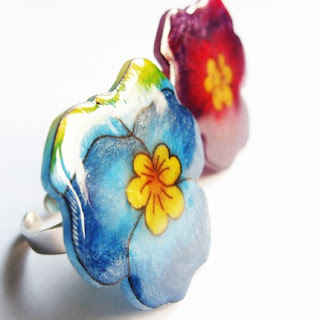 I’ve rather fallen for your pansy ring, but I don’t wear rings. Are you open to custom orders? For instance, I think your pansies would make a lovely bracelet. I love the idea of making something especially for someone. I have done a few wholesale orders, which have gone well. I would be totally open to any suggestions. You're my marketing guru. What’s your top tip for today? I think everyone is careful about striking a balance between advertising and pushing your name on people. I try to wear at least one thing that I have made a day, and fiddle with it a lot, so that people ask where I got it from. Then I clamp them into a conversation and force some business cards on them. It sounds aggressive, but I have had a number of off-site sales this way. Guess when I get most compliments? Yep - it's when I'm wearing the Meadow Bracelet! Thanks Katie, I hope you enjoyed answering the questions as much as I did! great interview! I have one of TwinklySpangle's Lindette bracelets and I love it. Oh my Nifty, am not sure who I love more in this interview Nifty or Twinkly! This is a charming interview, kept my interest all the way through. The back and forth was so fun and it makes me want to know and see more of both of you. Happy to have made your acquaintance TwinklySpangle. Glad you enjoyed eavesdropping on our chat :-) If you'd like to be my next victim, please get in touch. Great interview! I really love that you don't use "canned" questions! Twinkly, I love all your color! It must be so great to work among all that cheerfulness!